!! 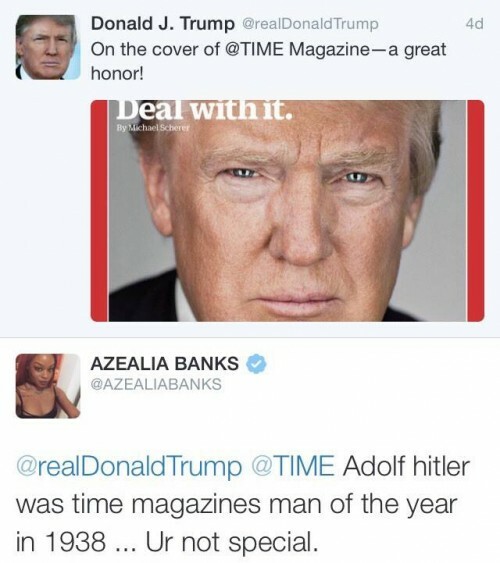 OMG, Azealia Banks reads Donald Trump TAH FILTH, puts him in his place !! Sometimes we can’t stand Azealia Banks‘ self-involved Twitter rants, but other times.. other times she’s right on point! Like when she compared Trump to Hilter in under 140 characters so gracefully. 2 Comments on "OMG, Azealia Banks reads Donald Trump TAH FILTH, puts him in his place"
I’m voting for him, totally agree with his views on immigration and hispanics…and yes, I am indeed small town gay, white, and a democrat. Yet she’s suggesting we all vote for him on Twitter based on her thoughts about other candidates. She’s crazy.